Fans of the Apple MacBook Air have been clamoring for an update to the thin-and-light laptop for a while now, and they won’t be disappointed by the fact that it’s thinner and lighter than ever before; however, it’s only slightly faster, and definitely more expensive, and if you’ve not been convinced by the MacBook Air before the cosmetic enhancements might not be enough to sway you. 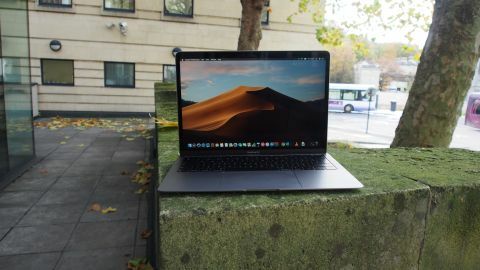 While the new MacBook Air doesn’t radically change the original’s formula – which was arguably the first Ultrabook – there is enough going on to maintain its spot as one of the best Macs you can buy. And, it may just be the best option for anyone looking to save some money on a MacBook with a Retina display. The MacBook Air 2018 features a better Amber Lake processor, a much improved Retina display and a thinner and lighter design that sees it place among the best laptops today. It lives up to the ‘Air’ moniker once more. You should keep in mind that this laptop is the most expensive MacBook Air ever, though. Sure, it’s cheaper than all the other laptops running macOS Mojave, except for the 2017 MacBook Air, but do the new features justify the high asking price? The MacBook Air 2018 is more expensive than any previous model. And, while people may be hoping that the 2018 version could match the $999 price of the previous MacBook Air, it’s still the cheapest laptop in Apple’s 2019 lineup. Though, it should be noted that Apple is still selling the 2017 MacBook Air. For anyone dismayed by Apple’s high (and rising) prices for its devices, that might not be much comfort, with the MacBook Air (2018) starting at $1,119 (£1,119, AU$1,849). With that price, though, you get an 8th-generation Intel Core i5 Y-series processor, 8GB of memory and a 128GB SSD. You can configure it with more powerful hardware, but the MacBook Air will obviously get more expensive from there. You can get up to 16GB of RAM and a 1.5TB SSD. There’s also a more expensive pre-configured MacBook Air for $1,399 (£1,399, AU$2,149) which comes with a 256GB SSD, but otherwise the same components. That’s a price increase of $200 / £200 / AU$300 for a bigger SSD, and even by Apple’s standards that’s a rather ridiculous price increase – you’d be better off sticking with the 128GB SSD and buying an external hard drive. If you want to configure your MacBook Air, you can double the RAM to 16GB at 2,133MHz for an extra $200 / £180 / AU$320. To up the storage to 512GB SSD will cost you an extra $400 / £400 / AU$600 to upgrade from the base model, while upgrading to 1.5TB is an extra $1,200 / £1,200 / AU$1,800. No other components can be changed on 2018's Apple MacBook Air, which means you’re stuck with the disappointing choice of a 1.6GHz dual-core 8th-gen Intel Core i5 processor. The above costs also highlight Apple’s crazy-expensive prices for storage. We haven't tried to take the MacBook Air apart, but we’d wager it’s extremely difficult to open it up and install a larger – and cheaper – SSD yourself. Still, the market for premium $1,000/£1,000 laptops is more packed than it’s ever been, with some amazing machines dominating the price point, mainly spurred by the success of the original MacBook Air. With a price of $1,199 (£1,199, AU$1,849), the MacBook Air 2018 is going head to head with some sublime Windows laptops, like the Huawei MateBook X Pro and Dell XPS 13 – both of which offer more powerful components and beautiful displays for comparable prices. Where the MacBook Air used to be unquestionably the best laptop at this price point, it’s now facing an uphill battle to reclaim that title – and sadly, with these specs, it’s not quite going to manage that. Of course, the XPS 13 and MateBook X Pro are only viable alternatives if you’re prepared to switch to Windows 10. If you’re wedded to macOS and Apple’s ecosystem, then the Apple MacBook Air (2018) offers the most affordable way to get a new MacBook – however, that doesn’t mean it offers the best value. For around $100 / £100 more you can get the base model of the 13-inch MacBook Pro 2018 ($1,299 / £1,249 / AU$1,899), which comes with a brighter screen and more powerful components. For many people, that extra money will be well worth the outlay for a better-performing MacBook. Or, if you want to save money, Apple is still selling the 2017 MacBook Air at the same $999 (£949, AU$1,499) price. However, you’ll have to give up the fingerprint sensor and the higher resolution display. Still, it’s $100 off the top, so it might be worth it. When the first MacBook Air launched 10 years ago the design made an incredible impact on the laptop market, as it proved you could have a powerful and feature-packed laptop in a thin and light design. One could convincingly argue that the MacBook Air caused Intel and rival laptop makers to create the Ultrabook category of laptops, which were premium devices that put power, style and thin and light design above all else. The original MacBook Air changed the laptop world back when it originally launched – there’s no getting around that – so, you’d be forgiven for expecting Apple to come out with a new, revolutionary design this time, too. And, if that’s the case, prepare for disappointment: Apple played things safe with the MacBook Air 2018. While this means it’s not a market-defining laptop like its predecessor, it does keep that iconic thin and light design, while benefiting from some important improvements where it counts. So, the new MacBook Air is smaller than the original, making an already thin and light laptop even more portable, with dimensions of 11.97 x 8.36 x 0.61 inches. And, the MacBook Air case still has the same wedge-shaped design, so it tapers off to 0.16 inches at its thinnest point. As we noted in our initial hands-on review of the new MacBook Air, the new laptop has the same width and depth as the 13-inch MacBook Pro, while being a bit thinner and lighter. The reduced size and weight of the MacBook Air doesn’t mean there’s a cut to features. You still get a 13.3-inch display (more on that here in a sec), and we’ve already mentioned that it comes with faster hardware, including an 8th-generation fanless dual-core processor and 8GB of RAM, which can be upgraded to 16GB. Port-wise, you get two USB-C (Thunderbolt 3) ports along the left-hand side of the MacBook Air. You can use either one for charging, and we’re glad that Apple continues to use the USB-C format as a charging port, rather than its proprietary MagSafe port, which makes the Air a far more user-friendly and flexible device. One issue we were initially concerned with was the fact that both USB-C ports are along one side, and quite close together, as this means that, when the MacBook Air is plugged in to charge, the second USB-C port can be a bit too close to plug things in unless you have an adapter. Having a USB-C port on either side, like the Dell XPS 13, would have avoided this situation, while giving you a bit more flexibility when it comes to charging. However, for most people this won’t be too much of a problem, and we’re glad to see Apple move over to USB-C for the latest MacBook Air. It helps keep the body of the MacBook Air slim, while future-proofing the laptop by making it compatible with new and upcoming USB-C peripherals. If you rely on legacy USB peripherals, then you’re going to need a dongle or dock for them to work with the Apple MacBook Air (2018). Yes, that’s annoying, but you’ll likely find that you’ll soon need to do this with most modern laptops, especially premium thin-and-light Ultrabooks. The two USB-C ports are certainly a step up from the single USB-A port of previous MacBook Airs. The only other port is a 3.5mm headphone jack – an increasingly rare sight on Apple products – on the right-hand side. The Apple MacBook Air has a redesigned keyboard that features Apple’s third-generation butterfly mechanism, which Apple claims provides four times more key stability than standard laptop keyboards, while offering greater comfort and responsiveness. In our time with the new MacBook Air we found that the keyboard does take a little getting used to, especially if you’re coming from an older MacBook Air, but once your fingers adjust it ends up being quite a pleasant typing experience. The keys are very shallow, travel-wise, so you don’t quite get the responsive feedback you get from other laptop keyboards, but that’s the price you pay for such a slimline design. There’s also a satisfying ‘click’ to the keys when pressed, although this does make it a bit more noisy to type on than previous versions. However, the mention of a ‘butterfly’ keyboard may worry anyone who's seen the spate of reports about how the butterfly keyboards on some MacBooks were encountering issues. Apple hasn’t revealed if it has made any tweaks to the butterfly switches of its keyboards to prevent future issues, and while at the time of writing this review it’s too early to be getting reports of MacBook Air (2018) owners encountering the issue, it may give some people pause. Time will tell if the much-maligned butterfly switches used in this keyboard suffer from similar issues as previous generations, but we hope Apple has addressed many of the problems with this third-generation model. The MacBook Air (2018) also has Touch ID built in, allowing you to log into the laptop with your fingerprint. It’s a useful, time-saving feature, and genuinely makes logging into the MacBook Air quick and easy. As with other Mac devices that have Touch ID, the feature works very well, detecting fingerprints and logging us in without any issues. While Touch ID is here, the Touch Bar – the MacBook Pro’s slim additional display that sits in replace of the function keys, offering contextual shortcuts for the apps you’re currently using – isn’t. This feature likely won’t be sorely missed, though, with the function keys along the top being more than adequate for offering quick access to various tools. While the chassis surrounding it has shrunk, the Force Touch trackpad has actually grown, and is now 20% larger than the standard trackpad on previous MacBook Airs, offering more room for gestures and to move the cursor around – you won't want to go back to a smaller trackpad once you try it. Also, unlike on older MacBook Airs the trackpad is now flush with the body, and requires only gentle presses to register as clicks. It’s a much more comfortable, and quieter, experience. The use of recycled aluminum makes this the greenest MacBook ever, according to Apple, and while its unibody design has been made from the metal shavings from previously machined devices (which means Apple doesn't need to mine and smelt further materials), there are no blemishes or marks; this is the same premium-looking – and feeling – MacBook Air we’re used to, just greener. Apple told us it has achieved this design feat by employing full-time, in-house metallurgists to help ensure that the recycled aluminum body is up to Apple’s rigorous standards. The MacBook Air (2018) unibody shell is cut from a solid block of aluminum, which gives it a sturdy feel despite its thin and light design. It’s an impressive machine to hold, feeling light enough to easily carry around yet robust enough that you can happily chuck it in a backpack and take it with you when you’re on the move. The speakers have also been improved, and despite their small size have twice the bass of the previous model’s, and are capable of 25% louder volume. The T2 security chip, which is built into the MacBook Air and offers a number of security features, also helps with stereo spacing of the speakers. The idea is that this gives the impression of the two speakers being further apart than they actually are – we tried it out by watching some films, and there is a clear distinction when sounds pan from left to right, although it doesn’t rival a proper stereo setup with speakers placed at either side of a room. The speakers are clear, with a good range, and they still sound really good at high volumes. This sort of sound quality is rare on slim and light laptops, and the improved audio, combined with the updated and improved high-resolution screen, makes the MacBook Air a brilliant laptop for watching films and listening to music on. Apple is offering a range of colors for the MacBook Air: Space Gray, Gold and traditional Silver. However, the illuminated Apple logo has been dropped for a chrome one – the thinner lid design can't accommodate that classic piece of design flair. Overall, while the design isn’t as revolutionary as that of the original MacBook Air, Apple has gone to impressive lengths to improve on the look and feel for the new model. The screen on the Apple MacBook Air (2018) is where Apple has arguably made the biggest, and most welcome, changes. Despite the overall size of the Air shrinking compared to previous models, the screen size remains the same at 13.3 inches. This was achieved by slimming down the bezels around the screen, and not only does it mean the new MacBook Air is smaller and more easily portable than its predecessors, it also means the screen itself is more prominent when in use. The screen keeps the 16:10 aspect ratio, but that’s where the similarity to previous MacBook Air screens ends. The MacBook Air (2018) is the first Air to come with a Retina display, with a resolution of 2560 x 1600 pixels. This results in a pixel density of 227 pixels per inch (ppi), which is a little sharper than the MateBook X Pro, and easily outclasses the entry-level XPS 13. The Retina screen gives this MacBook Air four times the resolution of previous models. The leap from the 900p resolution of older MacBook Airs to the Retina resolution really is impressive, and it’s likely the first thing you’ll notice when you power on the new Air. Anyone who felt the lower resolution of previous MacBook Air models was a bit cramped when working will really appreciate the improvement. The new MacBook Air display is actually on par with the more expensive MacBook Pro, the 13-inch model of which features the same screen size and resolution. However, the MacBook Air 2018 doesn’t feature the pro’s True Tone technology, which is designed to adjust the colors of the screen to make them more accurate depending on ambient lighting conditions. The MacBook Air’s screen doesn’t go quite as bright as the MacBook Pro, either. Apple has also dramatically improved the viewing angles of the screen for this year’s MacBook Air. That was one of the biggest pain points when using old MacBook Airs, to the point where tilting the screen just a little bit away from our faces made the screen pretty much impossible to view. The 2018 MacBook Air fixes that. It was only at the most extreme angles that we saw a lot of reflection from the anti-glare glass that's protecting the LCD screen. There’s also been a boost to color accuracy for the MacBook Air (2018), with a wider color gamut capable of displaying 48% more colors than the previous Air – it means that photos in particular look bright and vibrant on the new MacBook Air’s screen.